My friends, today I am 30 and I am embracing it with both hands, pulling it in close, and wearing it like crushed velvet. 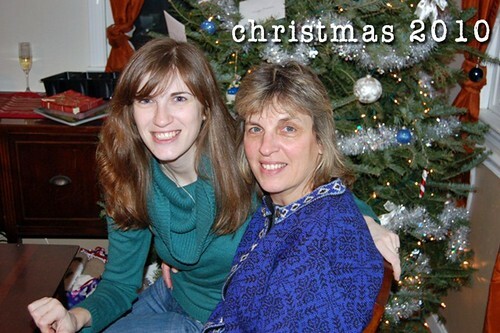 Today’s post is for my beautiful Mom, MaryAnn. 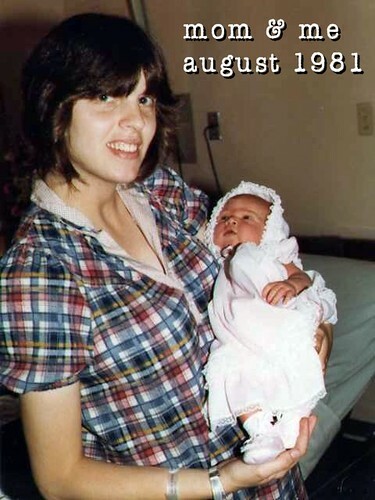 She was the first person to hold me 30 years ago today, and is the person most likely to be holding my hand tomorrow. My mom has three daughters. 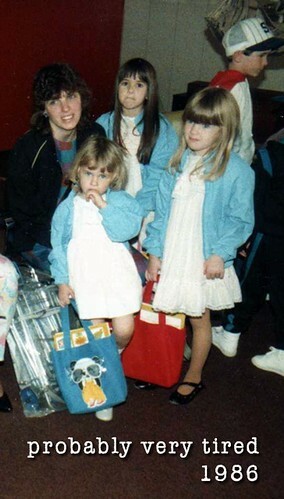 Courtney was born in 1980, me in 1981, and Tara in January of 1983. Just pause for a moment to imagine the madness of three little girls that close in age, then think about how much harder it got for her two years later when she found herself going through a divorce and raising us mostly on her own. She was twenty-nine years old. I wouldn’t be smiling either if I was holding one kid, had another pulling on my hair, and yet a third (me) doing something weird behind my head. But she did smile a lot. Despite how overwhelming and difficult that time must have been for her, Mom never put anything before her girls, and focused on rebuilding a life for our family. She called us “cherubs” and piled on the affection, which we reciprocated. My aunt likes to tell us, “Your poor mother couldn’t even go to the bathroom without you kids banging on the door because she wasn’t holding you!” To this day we are still an affectionate bunch. Before you roll your eyes, please know it wasn’t always kittens and cupcakes. 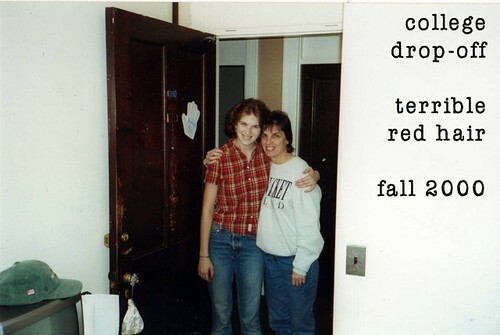 My teen years with my mom were more than typical. We fought a lot. I told her she didn’t understand me, and she told me I had a lot to learn. Doors slammed, punishments were dealt, but then I moved out of the house for college and the pressure lifted. I started to look forward to our phone calls, and on visits home we would plan special outings together. My mom and I both get excited about visiting historical sites, shopping for consignment housewares, visiting bakeries, and stalking library book sales. Our relationship began to grow in a new direction. In the years since then my mother has become something entirely different to me than just my parent. She is a wonderfully unique person, and someone who I love and admire beyond compare. I look to her as an example for how to live my life with honesty, kindness, and a slightly-warped sense of humor. I also look to her for company on my walks home from work, as my top taste-tester, and source of secondhand cookbooks. Lots and lots of cookbooks that I don’t have room for, but cannot refuse. Today I turned 30, and I wouldn’t be here without her. I can’t say with any certainty that I know where the near future will take me, but I do know my mom will be there, encouraging me and sharing my enthusiasm. Thanks for giving birth to me, Mom, and for everything else you have given me since. I love you! Happy Birthday Aimee! What a beautiful tribute to your wonderful mom. I really enjoy reading your blog, and even subscribed to Yankee Magazine just to read your column! Best Wishes always. Aimee, This is beautiful! I am tearing up reading it! Enjoy your birthday! Oh, Aimee! *Tears* You’re such a great person, daughter, co-worker, friend, sister, author, baker, photographer, citizen of the world. All of the very best of your mom!!!! In honoring her, you honor not only yourself, but your sisters. How lucky are we to have an opportunity to know your mom through you? To you and your mom – nice job! 🙂 Enjoy your birthday. I also am tearing. As a Mother of four, I have to say there is nothing as wonderful as having a strong loving bond with your children. Then to have one of your children expound in such a positive way how much they love you and how wonderful and special you are…… it’s very touching. It’s a gift to your Mother. What a beautiful post dedicated to your Momma, I hope you both enjoy celebrating this special day! Here’s to 30!! Happy birthday, Aimee! I hoe you have a delicious day. Really lovely post Aimee! I can definitely identify with the progression of your relationship with your mom. Happy birthday! close and personal bond we have had! AWwwww Aimee -this is beyond touching! I loved reading every word of this, and viewing every photo! Happy birthday to you- and yay for your mom! Aimee, this is such a nice tribute to your mom. So sweet. I can only hope that I leave an impression on my children the way your mother has on you! Much love on your 30th!!!! 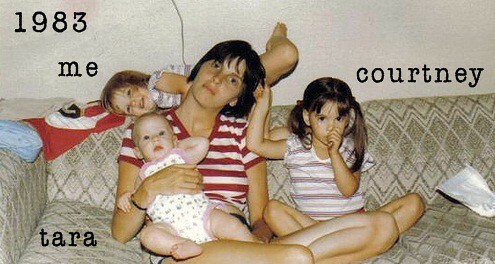 Jenn and the Cummings Clan!!! MaryAnn, You have done such a wonderful job with your girls and I do so remember your “warped ” sense of humer. Lovely words Aimee and I hope you have a wonderful 30th birthday. What a lovely post! Your mom must be very touched. Hey there! 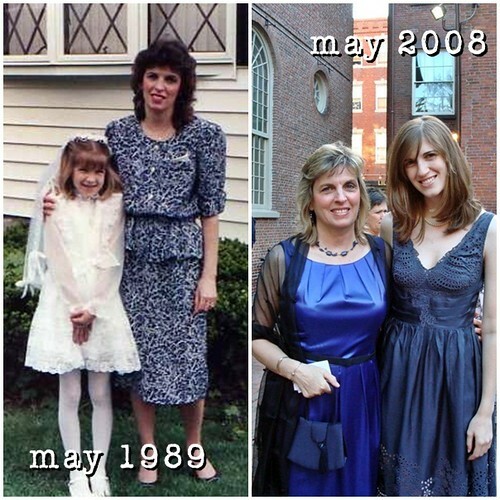 Love the tribute to your mom… it’s such a great way to ring in your 30th. Hope you had a wonderful birthday! So happy to know (and love) your very special mom….she never fails to make me laugh….and she’s always there for me too! Aimee, this post is wonderful. And so like you to celebrate your birthday by celebrating the woman who made it possible. Your giving nature is part of what makes you so special. I don’t think any mother or daughter could have read this post with dry eyes. May you have many years of sharing life with your lovely mom. Beautiful post! A very happy 30th birthday to you! The most beautiful post I thinkI’ve ever read. Congratulations to both of you. Beautiful! Here’s to many more milestones celebrating your very special bond! Happy birthday Aim- much love to you and your momma! Happy birthday! What a touching tribute to your mom, she sounds like an amazing person. Isn’t it funny how your relationship with your parents seems to grow once you leave the nest? My bf NEVER got along with his mom, then he moved out, went to college, and they are bff’s, it’s funny to remember how it was a mere decade ago. Touching post, beautifully written. Happy Birthday! This is so sweet. Your mom seems like both a sweetheart and a strong lady. You look so alike! What an awesome tribute! A very sweet story both in content and form. Happy Birthday! Happy birthday, Aimee! What a lovely post! That was really really sweet! Happy birthday! What a sweet, sweet tribute to your mom. Thanks for sharing your memories and the cute pics! Happy Birthday Aimee! This is such a beautiful post about your mom, thank you for sharing. Aimee Happy Belated Birthday! Just came back from being away so sorry I missed your big day! I am sitting here reading this and just crying away because your mom is a beautiful person inside and out. But to have her daughters know that and appreciate it is so rewarding. I use to fight with my mom about the same things as you and as I got older I realized how wrong I was and how right she was. She has been gone for almost 8 years and I miss her everyday so I am glad you 3 girls can cherish her because she deserves it! What a wonderful tribute to your mom!!!! Happy Belated Birthday! Aimee, I ran into your blog through a post your mom made in a group on Facebook. I love your blog, I love to cook, and I had to order the Yankee Magazine cookbook with the Anadama bread recipe in it from Amazon. What a lovely tribute to your mom, tell her Patty Wheeler says hi! So glad you liked the post – I know you will love the Yankee cookbook. Yankee knows its New England recipes! Thanks for commenting!